Upcoming. May 2019: Ladysitting: My Year with Nana at the End of Her Century (W.W. Norton & Co.). A memoir about sharing life and facing death. SafeKidsStories.com, a web-based initiative to crowdsource stories for a wide audience of general interest readers, kids, parents, and eduators. UPenn students' submit their work for publication on the site. Fall 2018's initiative: #VoteThatJawn, a SafeKidsStories platform to share information among and encourage youth peer-to-peer voter projects. Non-fiction: Cary's boarding-school memoir Black Ice, has been taught in colleges and high schools since 1991; and her collection of true stories for young readers is: Free! Great Escapes from Slavery on the Underground Railroad. In 2013, comedian Kevin Hart sponsored a free Black History Month download of the Kindle edition for teachers. From her time as an intern at TIME and contributing editor to Newsweek, she has published magazine articles and blogs. Fiction: The Price of a Child,Cary's first novel, about an 1855 fugitive liberated from the Philadelphia ferry, was chosen as the first One Book One Philadelphia selection in 2003. Her other fiction includes a girlfriend novel, Pride, and If Sons, Then Heirs (2011), a contemporary love story whose geography traces the African-American Great Migration. Essence magazine called it "a triumph." Scripts: Cary's scripts for five LED-screen presentations, filmed by Louis Massiah of Scribe Video for The President's House on Philadelphia's Independence Mall, commemorate the lives of enslaved Africans in the household of George and Martha Washington. Next to the Liberty Bell, the videos in this outdoor exhibit create an immediate, emotional experience, grounded in fact, for millions of visitors each year. Community: Cary founded Art Sanctuary, an organization that uses the excellence of black arts to enrich our region, in 1998. Serving more than 15,000 annual participants at its height, Art Sanctuary has featured such artists as The Roots band, writer Chinua Achebe, choreographer Bill T. Jones, the Cuban Folkloric National Dance Company, jazz composer Hannibal Lokumbe, and Philadelphia Poet Laureate Sonia Sanchez. In 2012, Cary stepped down to promote new leadership. From 2011-2013, Cary served as a member of Philadelphia's School Reform Commission. She convened a community-wide Safety Committee on that sponsored a summer Safety Summit for administrators and oversaw revision of the Code of Student Conduct to help decrease suspensions. 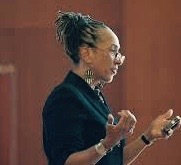 In October 2015, Cary founded, with the help of her UPenn students SafeKidsStories.com, to depict stories of youth safety, peace, and non-violence with the clarity and imagination that we usually reserve for the depiction of violence and conflict. Honors and awards: Cary is grateful to have received honorary doctorates from Swarthmore, Muhlenberg, Colby, and Keene State Colleges, and Arcadia and Gwynedd Mercy Universities. She has received awards including the UPenn Provost's Award for Distinguished Teaching and The Philadelphia Award. Teaching: Cary's teaching reflects these experiences in courses that encourage students to create works of beauty that will be of intellectual and emotional use to real readers. Students are required to submit at least one piece for publication on SafeKidsStories.com. KWH: Essay, Blog, Tweet, Nonfiction Now! Lorene Cary writes libretto for new opera "The Gospel According to Nana"
ENGL 135.402 Essay, Blog, Tweet, Nonfiction now! ENGL 135.402 Essay, Blog, Tweet: Nonfiction Now!